WoundRounds®, the leading wound management solution, and Nautilus Medical, the leading radiology image exchange solution, announced their joint partnership to advance wound care data management. As patients get discharged to lower acuity care settings, the WoundRounds & Nautilus partnership allows for the seamless flow of critical wound documentation between acute & post acute providers, facilitating more coordinated patient care & outcomes. WoundRounds®, the leading wound management solution, and Nautilus Medical, the leading radiology image exchange solution, announced their joint partnership to advance wound care data management. WoundRounds is a point-of-care wound management solution care teams use to capture wound data and images for use in treating patient wounds, and now Nautilus will enable the sharing of wound images and critical patient data between acute hospitals and post acute provider partners such as skilled nursing facilities, long term acute care hospitals, and inpatient rehabilitation facilities. Nautilus offers the most secure image transfer system on the market to nearly 600 hospitals, including 30 of the top 50 medical centers. Customers include Cleveland Clinic, New York Presbyterian, University of Pennsylvania, Northwestern, and Harvard . “Partnering with WoundRounds propels our imaging solutions into the post acute provider market, and delivers a key piece of the puzzle to our hospital customers, who seek to establish critical technology links with the post acute providers that care for their patients post-discharge. In the world of expanding Accountable Care Organizations (ACOs) and bundled payment, technology-enabled care coordination between acute and post acute providers is the cornerstone,” says Tim Kelley, CEO of Nautilus Medical. The rise of chronic disease and a rapidly aging population is driving unprecedented demand for wound care expertise, placing the quality of wound documentation into sharp focus. Highly standardized wound documentation which includes wound photography is regarded as best practice today, and the embedded functionality of the WoundRounds platform enables clinicians to efficiently document and photograph wounds via automated wound assessments, providing healthcare providers with both quantitative and visual evidence of wound healing. “As patients get discharged to lower acuity care settings, the WoundRounds and Nautilus partnership allows for the seamless flow of critical wound documentation between acute and post acute providers, facilitating more coordinated patient care and better patient outcomes,” adds Mike Diamond, President and CEO for WoundRounds. “Coordination across the care continuum has been one of healthcare’s greatest challenges, but care transitions offer one of the greatest opportunities to improve care and reduce costs,” says Diamond. 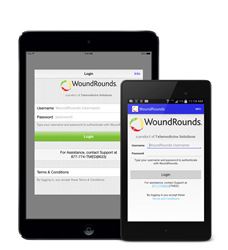 WoundRounds, a service of Telemedicine Solutions LLC, is the point-of-care wound management and prevention solution that empowers clinicians to deliver better wound care in less time. WoundRounds drives consistency in nursing practice, completeness in wound documentation, and compliance with clinical standards. For more information, please visit http://www.woundrounds.com or follow us on Twitter @woundrounds. Nautilus Medical Imaging Solutions, a company based in Chicago, IL, is a leading software developer and system integrator of DICOM distribution systems. Nautilus Medical is well known for designing easy to use software applications with the end-user in mind. The executive staff and IT engineers represent over 100 years in the medical field. Nautilus continues to provide solutions worldwide for recording and distribution at major medical institutions. For more information about Nautilus Medical, please visit http://www.nautilusmedical.com.